Over-looking the beautiful Fraser River, the “Music on the Wharf” concert series has something for everyone in the family. It started with a local band offering to play a one-time concert and has become one of the Maple Ridge Historical Society’s most popular annual events. 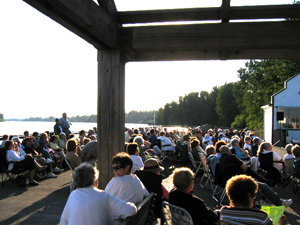 Since 1997, this free (by donation) concert series has taken place on the Port Haney Wharf [located on River Road, just east of the Port Haney West Coast Express station]. Twice in July, and twice in August on Monday nights at 7:30pm (except for the last Monday in August, which is at 7:00pm) the concert series features local and regional bands. The performers cover a variety of musical styles including Jazz, Blues, Bluegrass, Brass Band, Rock and Western. This is a great way to get to know the rich music scene in Maple Ridge. There is no seating provided at this event so bring a lawn chair. The best seating area fills up fast so it is best to be there early. Parking is limited so plan ahead and carpool if you can. There are refreshments available. We are grateful to our many sponsors who help make this a success every year. Come and join us for our summer music series to celebrate historic Port Haney. In case of rain, the concert will be cancelled, this decision will be made by noon the day of the concert. Signs will be posted at the venue, and you can contact 604-463-5311 for more details.